On April 10th, great news arrived at the Community Cycling Center – we received a Metro Regional Transportation Options Grant! 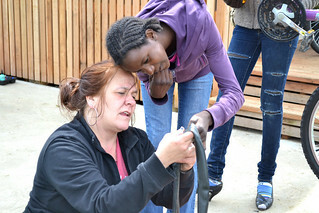 Training Community Bike Educators at Hacienda and New Columbia to complete basic bike maintenance, while they pass on these skills to their friends, families, and neighbors. Distributing maps, lights, and helmets – transportation and safety accessories that are needed in these communities. Hosting two open forums for community members and local decision makers to examine the challenges and promise of increased active transportation in underserved neighborhoods. 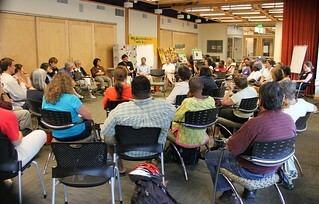 Remember our Bikes for All community conversation at New Columbia in 2010? We’ll be reprising this event to ensure that community voices are amplified in a forum where planners and decision-makers are listening. We could not be more excited to continue addressing the barriers to bicycling experienced by these communities, while working together to empower community bicycle champions at Hacienda, New Columbia, and NAYA.